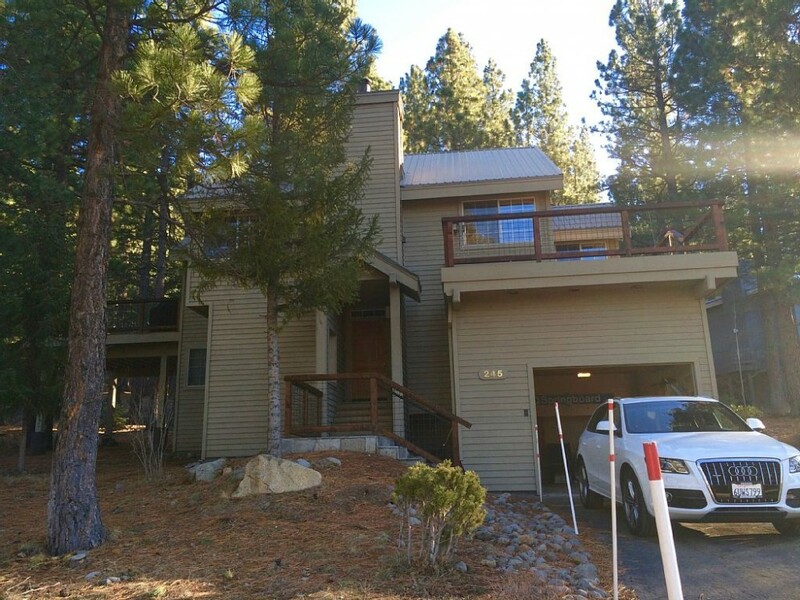 This 3 Bedroom/3 Full Bath beautiful home is in the heart of the Northstar resort. The home has undergone a complete upstairs remodel featuring an casual open great room design, skylighting, new kitchen, hardwood flooring throughout, remodeled bathroom, and a huge teakwood deck to enjoy outdoor dining and relaxing. The home is bright and sunny with large windows and skylights to let the sunlight in and take advantage of the beautiful tall pines that surround this gorgeous forest setting. The home is tastefully decorated with new furnishings throughout. Conveniently located on Basque Drive, with views of Martis Valley and walking distance to the golf course, and the convenient Northstar shuttle picks up right at the driveway for a five minute ride to Northstar Village and the ski lifts. Parking is available for 3-4 vehicles in the garage and driveway. Downstairs features two full Master Bedroom suites, king-size Sleep Number® adjustable beds, and luxurious linens. Upstairs is a full size bedroom with extra-length twin beds and separate guest full bathroom. Two queen-size automatic air beds and linens are provided for extra guests. The living room is furnished with comfortable leather sofas, recliner and a big screen television. Stream your own music to the wireless surround sound system, and enjoy wireless internet access throughout the home. The fully equipped gourmet Kitchen has everything you need to cook a full gourmet meal, or outdoor BBQ grill. And separate laundry room is fully supplied and available for guest's use. With the rental, all resort homeowners amenities are included allowing access to the amazing Northstar recreation center. Amenities include a state of the art gym, Olympic-sized pool, adult lap pool, and children's pool, three hot spas, arcade room, tennis courts, bocce ball, and basketball courts. Property Damage Protection available in lieu of Security Deposit for $59 per stay. Please contact owners for details. Send email to owners for booking request. Payments accepted through Paypal or certified check by mail. Very nice home. Comfortable, spacious and clean. We stayed for a week in mid summer. The house was very clean and had a lot of room to be comfortable. We would/will stay here again in the future. Our family (children ages 3 and 1) stayed here for an extended weekend and had a great time. The house was very cozy and had everything we needed. The location was perfect, the shuttle comes right to the front door and takes you to the village. Would recommend and would stay here again. We thoroughly enjoyed our stay during ski week. Conveniently located near the slopes at Northstar (with terrific shuttle service to the village), this home is roomy, well-appointed and extremely comfortable. The owners were terrific to work with, as well. We'll be back! Upstairs living and kids bedroom/bath is completely updated. Downstairs dual ensuites are comfortable and functional but baths are original. Sleep number beds are the best I've slept on--thanks. One suggestion--get a baby gate--we had to buy one at the truckee ace and it worked well for the 39inch wide stair landing, and kept our 1 year old safe.